Agio Imaging prints all sizes of rigid and flexible materials as well as fabricates, installs and often designs projects for display applications ranging from interior branding and décor to corporate and event signage. 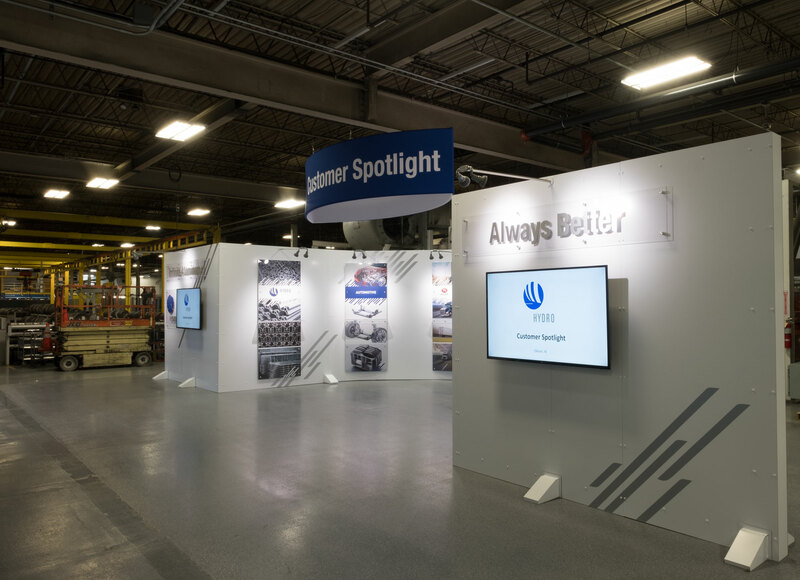 So, when a new opportunity to create a permanent customer display for a large manufacturing organization presented itself recently, Agio Imaging team members didn’t hesitate to develop a turnkey solution. 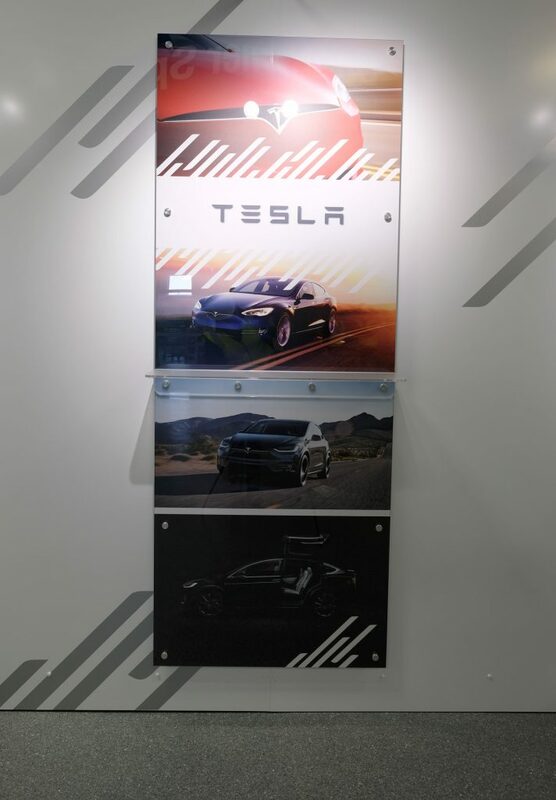 They knew Dibond® graphic display board by 3A Composites USA would provide the durability needed to not only clad a permanent structure but also offer outstanding ink adhesion for prints exhibited on its walls. 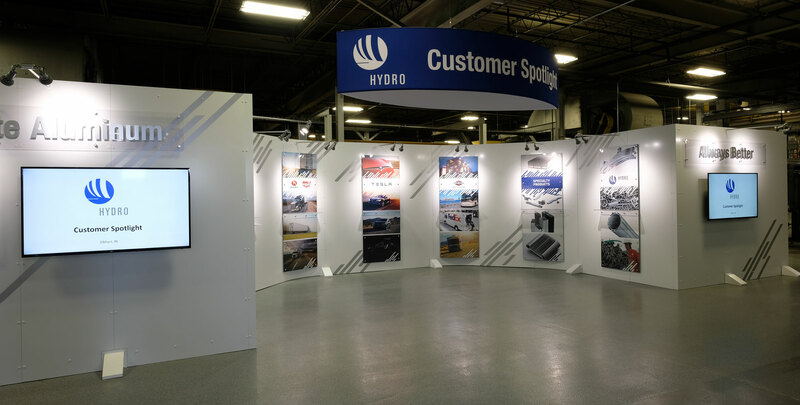 The structural display would be installed in a manufacturing facility of Hydro, a fully integrated aluminum company. 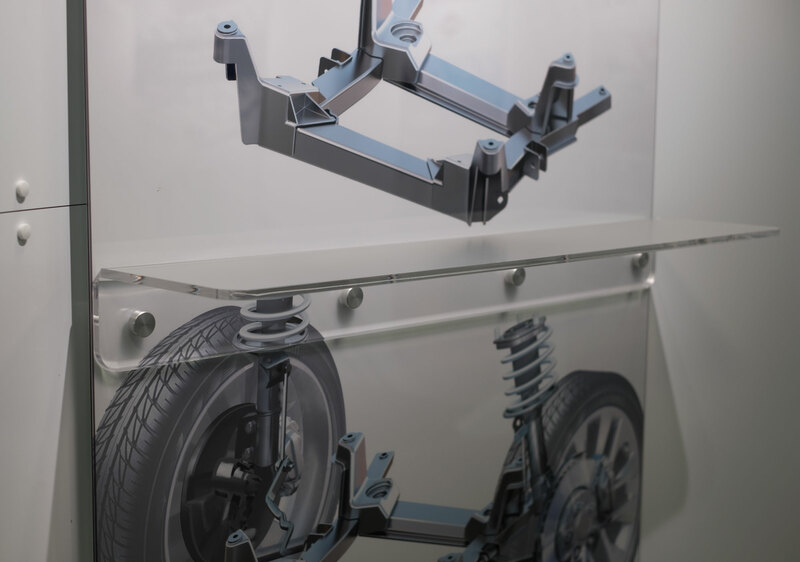 Located right across from the facility’s research and development department, the display would be utilized to showcase the company’s custom aluminum extrusion products to visiting customers. “Our client’s vision was to create a customer experience center to spotlight top clients and to showcase the capabilities of their manufacturing facility,” said Davina Logan, director of sales, marketing and administration, Agio Imaging. “Our solution offered a bright, open design that could include digital media integration, interchangeable panels for future updates and space for expansion. …. Agio Imaging purchased approximately 2,056 square feet of 3mm White Dibond from 3A Composites’ distributor Agfa Graphics, of Aurora, Ill., including: 36 sheets in the 5-by-10 foot size for cladding the structure and eight 4-by-8 foot sheets for direct printing customer display panels. Both 3-D modeling software and Adobe Creative Suite were utilized by Agio Imaging team members to design the approximately 45-foot wide by 10-foot tall by 17-foot deep display. Agio Imaging designed the display with a custom metal structure that is fully clad on all sides with Dibond. A Kongsberg X Series CNC router was used to cut the Dibond panels to their final size and shape and to mill holes for fasteners. The custom-fitted Dibond panels were mounted directly to the metal structure with decorative mechanical fasteners. The customer experience center is designed with a curved back wall installed between two flat end sections. Two 65-inch LCD display screens were direct mounted to the Dibond end sections to incorporate multi-media presentations. Agio Imaging utilized a super-wide format Agfa flatbed UV digital printer and OEM inks to direct print seven Dibond panels – routed to 36 inches by 95 inches – with images of products and customer end applications. The printed Dibond panels were sandwiched beneath acrylic sheets and directly mounted to the structural display’s back wall with 1-inch stand-offs to create dimensional interest. Acrylic shelves used to display customer products also were attached to the panels. While this was the largest freestanding customer display created by Agio Imaging, the company wouldn’t hesitate to create another custom permanent structure utilizing durable Dibond.